Old version of Scripture "wasn't reaching people anymore,"
so Lord shrinks psalms and other stories to 140 characters each and "live blogs" the Last Supper. That's how the story of creation is told in "The Twitter Bible," God's latest attempt to spread His message. "The old version of Scripture wasn't reaching people anymore," He explained at a press conference where every question seemed to be anticipated before reporters could ask. "So I signed up on Twitter.com." Writing under the pseudonym WWGT (What Would God Tweet? 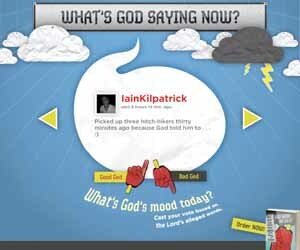 ), the Lord has begun condensing Bible stories into hip, 140-character updates. "Even I can't resist the awesome power of Twitter," He said. "I just hope I still have enough name recognition to attract more followers on the site than @RyanSeacrest or @The_Real_Shaq." To boost His audience, God plans to sprinkle posts with pop culture references and, if necessary, winning lottery numbers. 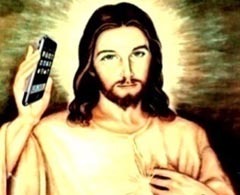 For example, Psalm 23 will read, "The Lord is my iPhone. If I need to visit a pasture, there's an app for that. If I need to walk the valley of death, there's an app for that." Meanwhile, the Book of Jonah gets condensed to a mere three sentences: "Jonah = reverse sushi. Big fish eats raw human, minus wasabi, then barfs him up 3 days later. Jonah's scared-straight talk saves Nineveh." God also hopes to live-blog the Last Supper, complete with Yelp.com reviews of the food ("tastes like chicken") by Jesus' apostles. He said the only Bible verse that won't need to be shortened is John 11:35  "Jesus wept."